The SAE DC Fast Charging System for electric cars is getting a shot in the arm thanks to ABB, who has unveiled support for that fast charging system, also known as the Combined Charging System (CCS). Fast charging systems give near complete recharges of typical electric cars in about a half hour, and when available they give electric car drivers more flexibility. The Combined Charging System came from the SAE committee that designed the J1772 plug commonly used in electric car charging today. To support fast charging the SAE committee added more pins to support a high power DC connection of about 50 kilowatts. The existing J1772 charging connection supports AC power at, typically, 3 kilowatts or 6 kilowatts depending on the on-board charger. The competing DC Fast Charging standard, CHAdeMO, is used by the Nissan Leaf and Mitsubishi i-MiEV. However several other automakers have thrown their support behind the SAE DC Fast Charging System (CCS), and it may be that this system will win out over CHAdeMO in the long run. The company's expanded product line includes several fast charger units. The first is the Terra 51 CHAdeMO fast charging station announced in May 2012. Another is the Terra SC Duo which supports both CHAdeMO DC fast charging, and a new three-phase AC system used in the Renault ZOE and Smart forTwo Electric Drive. 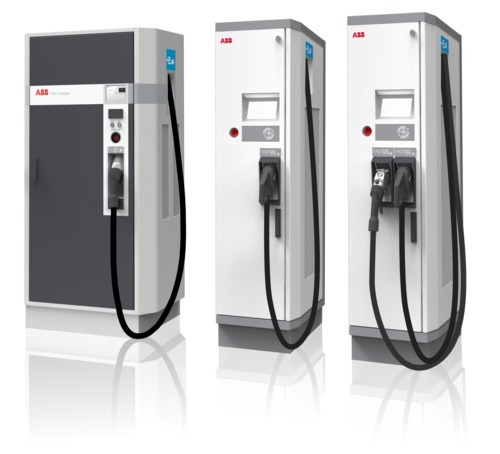 To support the Combined Charging System (SAE DC Fast Charging), ABB is adding two new stations to its line. One supports solely the Combined Charging System, while the other supports both it and the CHAdeMO system. The product line flexibly supports several combinations of fast charging systems, positioning ABB to be a leading charging station supplier no matter what charging protocol wins the market. ABB was the first company to demonstrate a CCS charging station, at the EVS26 conference last May. The new CCS capable fast chargers are part of the wider interoperability testing programs for all next generation electric vehicles. “ABB‟s expanded portfolio enhanced with its cloud-based connectivity services is a natural solution for EV infrastructure providers to effortlessly incorporate any charging standard -- be it CCS or CHAdeMO -- into their charging network without absorbing the high costs of software integration and testing, ” said Hans Streng, Head of ABB‟s Product Group EV Charging Infrastructure, a part of the company‟s Discrete Automation and Motion division. “By providing a broader EV infrastructure platform, customers can now simply tailor their installed base of fast chargers depending on the amount of CCS or CHAdeMO legacy cars available in a specific region.